I had received this doll on my birthday as a gift from my husband. I love doll collecting, and have been pretty good at getting a quality doll for a fair price, this doll is a mystery. She stands 25" tall, eyes bisque and comp in great shape. All fingers and feet accounted for, she still has the red marks on her toes and fingers. 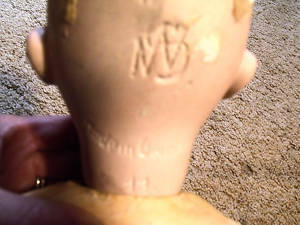 She does need some cleaning, The makers mark (symbol) is a mystery! At the bottom of her neck is a number 11 and made in Germany, that's it. I have looked in every book I could find, and, literaly all over the internet...nothing. I did get a chance to look in beteewn her ball joints and have found old yellowed German news paper wrapped around the ball joints. COOL! Please if you can tell me anything about this sweet doll I would appreciate it greatly.